It appears that I’ve allowed another year slip by without a post here. Oops. Chalk it up to writer’s block. I’ve had the following rambling mess incubating for a couple of years now. Sometimes it can be surprisingly difficult to figure out how to best approach a subject that is illustrated with dusty photographs dating way back to 2007. After all, that is ancient history in the world of modern ruins. I’ve always taken photos to document and help me remember the places and things I saw. Hence my dull and non-artistic compositions. But the original spark behind creating this site and sharing the images was the increasing shock and anger I experienced seeing the decayed state of the various downtown ruins in the late 1990s. For some youthful naive reason I expected buildings sealed with plywood to be fairly well preserved. Putting the photos online was a way to spread the shock, outrage, and concern in the faint hope of eventually helping change the situation. Perhaps that was naive as well, but it was a thought. At times I wonder if posting my older photos fits with that purpose. Abandoned buildings are dynamic, constantly changing in a sort of slow-motion demolition. If the photograph is intended to show the current condition of a structure, then waiting too long to display it renders the image obsolete. Does it really matter what a ruin looked like in any particular year? Obviously its condition will have been better ten, five, or even one year ago. Perhaps there is some use in showing just how far things have fallen? In any event, this site is pretty much a historical record at this stage, and is better viewed as a document of a rather depressing period of the city’s history than a presentation of the current state of affairs. So, for whatever reason, I present a retro trip to St. Agnes Church. This is presently one of the city’s most famous ruins. It doesn’t take a whole lot of effort to find references or images of the church online. It is safe to say that it is a must see on the “urban exploration” version of the grand tour. But the majority of the images out there have been taken after the building had fallen into an advanced state of disrepair. I prefer to remember the building as it was when I first saw it in late 2007. St. Agnes was a full scale Catholic parish. In addition to the church itself, the complex includes a school, rectory, convent, and a small power plant. For the sake of brevity I am leaving discussion and images of these structures for another day and will focus on the church building. Needless to say, the church is the far more interesting architecturally and was one of the last structures of the group to be vacated. The parish was a result of Detroit’s auto boom, its development and growth reflected that of the city in which it was located. 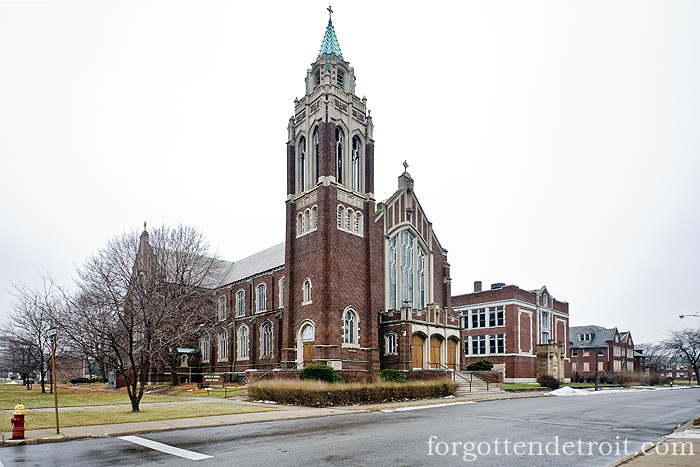 St. Agnes was founded in 1914 to serve the new LaSalle Gardens neighborhood. It blossomed with the city. The congregation’s needs quickly outgrew first a private house, and then a temporary sanctuary. The first permanent building was the school, erected in 1916. This was followed by a convent in 1917. Work on the present church didn’t begin until 1921 and was completed in 1924. 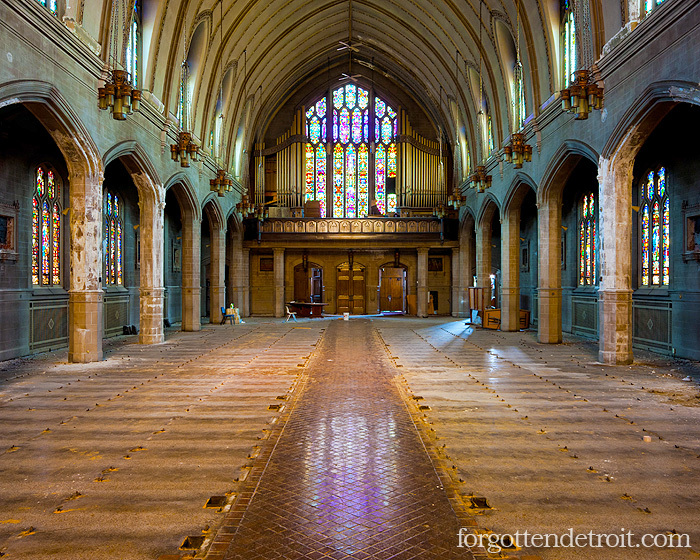 Its grand architecture and impressive size remain a testament to both the explosive growth of Detroit, and the popularity of a congregation that was only a decade old. The church did well until Detroit’s economic and population decline caught up to the city’s archdiocese in 1989. A controversial and painful reorganization was undertaken that year, one that included the closure of thirty churches. St. Agnes parish, which had been suffering from membership declines in the years following the 1967 riot, was among those targeted for closure. However, rather than being completely dissolved, the congregation was merged with another struggling parish, St. Theresa Aliva. Together these congregations created a new parish, the Martyrs of Uganda, to be housed in the old St. Agnes complex. Thus the structures received a brief reprieve. Ironically the former St. Theresa Aliva buildings, sold off by the archdiocese, remain functional and are in far better shape today. Sadly for St. Agnes, reorganization only delayed eventual closure and destruction. As was the case with its predecessor congregations, Martyrs of Uganda’s membership dwindled. By early 2000s the difficulties of a shrinking congregation housed in an aging and over-sized home became apparent. 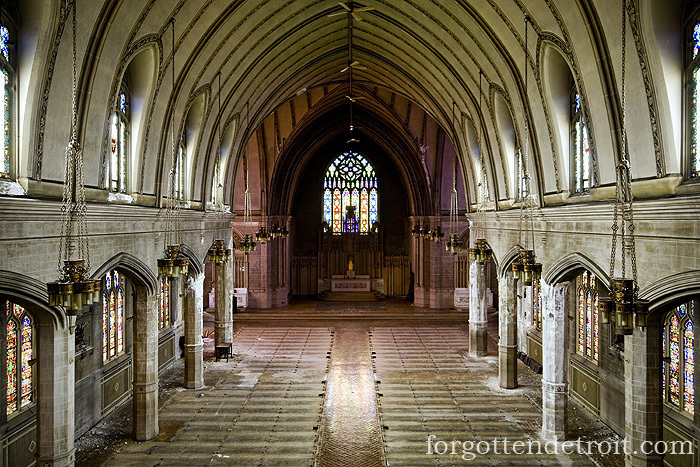 The maintenance demands of the church were simply overwhelming. Martyrs of Uganda was closed in 2006. 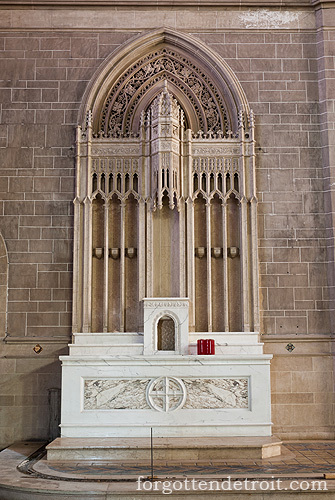 Shortly thereafter the archdiocese began the process of preparing the building for sale, including the removal of the Stations of the Cross, pews, and wooden organ pipes. The metal decorative organ pipes remained, but the actual musical pipes were gone. The process of the church’s ruination and demolition had begun. The church was not a ruin when these photographs were taken in late 2007. Aside from the items already removed from the building by the archdiocese, the building was remarkably intact. That said, it was a long way from being habitable. For instance, water damage was beginning to make its presence known, but it was far cry from the current mess. The floor was still clean; its tiled surface displayed a beautiful sheen. 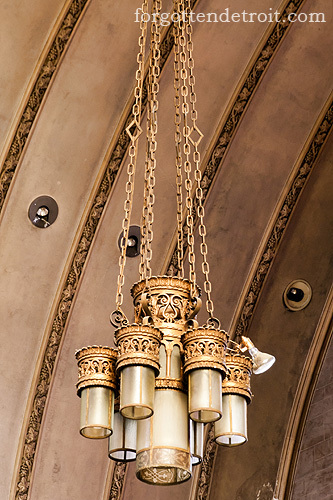 Several of the church’s artistic features, including the light fixtures, glazed floor and wall tiles, as well as alters were still in place. 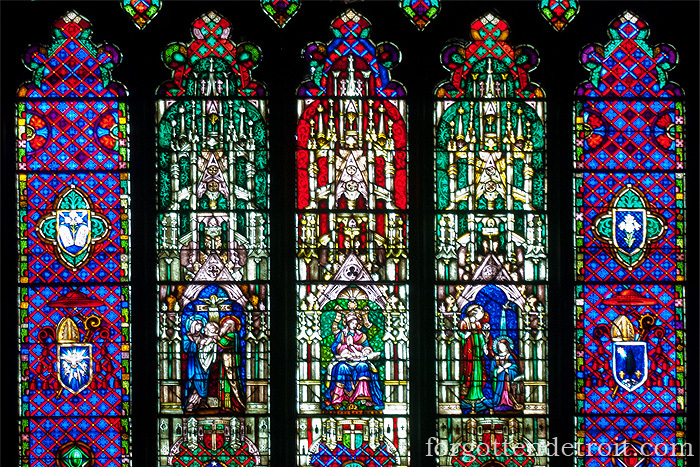 These all paled in comparison to the church’s most stunning feature, the stained glass. Every window was still in place. 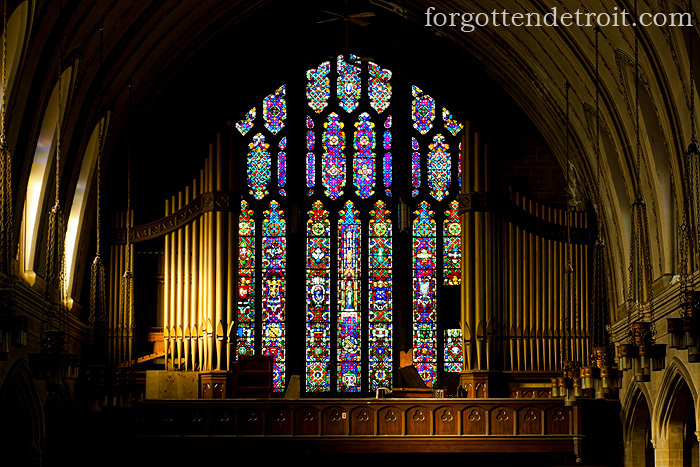 In a testament to the investment made by the church’s original builders, each window had a unique design. They depicted biblical scenes as well as images of saints. And while the individual designs were wonderful, my favorite aspect of the windows was the way in which they filled the interior with a wild array of colors. The floors and walls of the church glowed with purples, oranges, blues, and reds. I suppose I was lucky to see this. 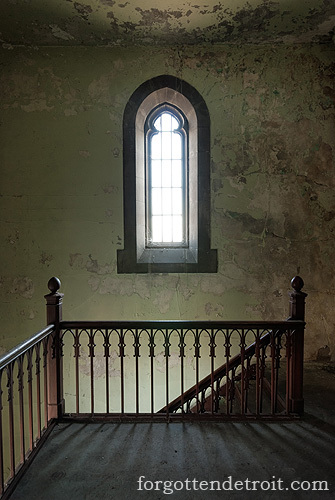 The archdiocese removed the windows in early 2008, leaving plain glass in their place. The look of the building was drastically altered as a result. The alters were also removed, but I am unsure of by whom. Current visitors to St. Agnes will see yet another example of the downward spiral that dooms so many abandoned buildings in Detroit. The building shown in these pictures no longer exist. Water has virtually destroyed the ceiling and walls, sending plaster raining down. As a result, the once shiny floor is now covered in moldy debris. Vandals have made off with the decorative metal organ pipes, smashed the glazed tiles from the walls, and torn out any metal fittings they could find. The interior remains colorful, but now the color comes from exposed brick, mold, and graffiti. It all gives me flashbacks to St. Cyril’s. But I never saw that building in as good of shape as this one. In a May 21, 2010 Detroit News article describing the difficulties that the city’s churches were facing in buying and selling surplus properties, the state of St. Agnes was cited as an absolute worst case scenario. No kidding. I haven’t made many return visits to the church over the years. The more it decays the less interested I am in seeing it. Give it time and the church will follow the University Club, First Unitarian, and countless other ruins into the vast building graveyard of memory. And this is how I will remember St. Agnes. I’ll remember a beautiful vacant building full of color, art, and an eerie emptiness. I wish I could say that I’ll remember a lively active church, but I never saw that. But at least it is better than the devastated ruin the building has become. Well, at least I can say that I’ve finally posted some of my photos of the building on this site. Of course now I also have photos of the church from visits made years later. Give it another decade and I just might get around to posting those as well. But, as you may have figured, I don’t like looking at those images. These are my go-to shots. Beautiful stain glass windows, I’m glad they were saved. Great looking building inside and outside but it takes money,maintainance, dedication, and willingness to keep any building in shape. Unfortunately I understand that the dwindling membership nowadays can’t keep these massive structures in the shape they to be. These are a part of any town and it’s too bad a use couldn’t be found instead just tearing it down. Scrapers are a virus to a city along with drug use and crime. People need church today more than ever, please attend the church of your choice this weekend.